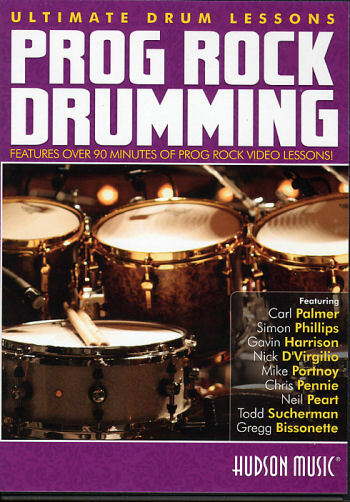 This DVD features over 90 minutes of Progressive Rock Video performances hosted by Rod Morgenstein (The Dixie Dregs) who offers his insights on each artist. #2: Carl Palmer - Famed drummer of Emerson, Lake, And Palmer is seen here in a vintage extended solo performance from 1970. #3: Greg Bissonette- Versatile over a wide range of musical styles, Greg is featured here playing a solo from "Submarine," which is one of the songs on his solo album. He starts with an explanation of some of the ideas that you'll see him use during the solo. #4: Simon Phillips - Simon, who has played with Toto, Jeff Beck, The Who, Pete Townsend to name a few, virtually started the trend toward using enormous drumsets that became the model for future generations of drummers. Here he's seen in a clip with his band playing at Modern Drummer Festival 2008. #5: Neil Peart - One of the most influential drummers of the past three decades, Neil is featured here talking about the structure of his drum solo for his Rush tour followed by a performance of "Subdivisions," which was one of five Rush songs inducted into the Canadian Songwriters Hall of Fame on March 28, 2010. #6: Nick D'Virgilio - Best known for his work with Spock's Beard, Nick has worked with Genesis, Tears for Fears and others. Here Nick is featured singing and playing drums to "A Guy Named Sid," a performance recorded at Modern Drummer Festival 2008. #7: Mike Portnoy - Mike, with Dream Theater, have probably covered music featuring nearly every time signature possible. Here Mike demonstrates some of his favorite drum fill pattern and his approach to playing odd time signatures, including 19/16 time as used in the song "Home," which Mike plays. #8: Todd Sucherman - Todd, best known for his work with Styx, is featured here on the Styx tune "One With Everything." This performance was originally recorded at the Modern Drummer Festival 2008. #9: Gavin Harrison - Best known for his work with the band Porcupine Tree, here Gavin opens with an explanation and demonstration of what he refers to as overriding (originally from his DVD Rhythmic Horizons). This is followed by Gavin's application of overriding to the Porcupine Tree track "The Sound of Muzak" and a performance of "Anesthetize," originally recorded at Modern Drummer Festival 2008. #10: Chris Pennie - Chris, first known for his work with The Dillinger Escape Plan and more recently Coheed and Cambria, explains and demonstrates his approach to polyrhythms and then applies them to the tune "The Glass Ceiling" by Fight Mannequins. Originally recorded at Modern Drummer Festival 2010. This contains Rod Morgenstein's Winger drum solo. As per the warning on the back cover the DVD, the material in this compilation has been previously released by Hudson Music. Also, if you are looking for a strictly instructional DVD this isn't it. But if you are interested in progressive style drumming and enjoy learning from watching some great performances, you'll enjoy this compilation of some of the world's greatest drummers.